The topic of this book is homogenization theory and its applications to optimal design in the conductivity and elasticity settings. 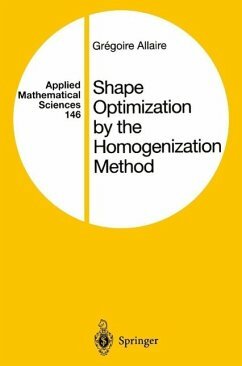 Its purpose is to give a self-contained account of homogenization theory and explain how it applies to solving optimal design problems, from both a theoretical and a numerical point of view. The application of greatest practical interest tar- geted by this book is shape and topology optimization in structural design, where this approach is known as the homogenization method. Shape optimization amounts to finding the optimal shape of a domain that, for example, would be of maximal conductivity or rigidity under some specified loading conditions (possibly with a volume or weight constraint). Such a criterion is embodied by an objective function and is computed through the solution of astate equation that is a partial differential equa- tion (modeling the conductivity or the elasticity of the structure). Apart from those areas where the loads are applied, the shape boundary is al- ways assumed to support Neumann boundary conditions (i. e. , isolating or traction-free conditions). In such a setting, shape optimization has a long history and has been studied by many different methods. There is, therefore, a vast literat ure in this field, and we refer the reader to the following short list of books, and references therein , , , , , , , , , , .